Originally built in 1938, the Hobart Tepid Baths were opened by the then Governor of Tasmania, Sir Ernest Clark and were described as a blessing to the city. Thousands of Tasmanians learnt to swim there. Between 1976 and 1984 the building was occupied by the Lord Mayor of Hobart. Until 2015 the building was derelict and is now home to the hugely successful Linear Park development. Now the final piece of this stunning urban renewal is complete: Apartment 29, within the original art deco building. A truly unique property. No expense has been spared, in the thoughtful and original creation of this sublime two bedroom + study apartment. More particularly it comprises: two spacious double bedrooms, a stunning designer ensuite with signature black tapware and fittings, similarly gorgeous main bathroom-laundry, study and a generous size warehouse-like main living-kitchen-dining area with American Oak joinery, a huge honed high tensile steel island bench, three AEG ovens, wine racks, Hafele induction hot-plate, Hafele integrated refrigerator and the original red brick walls with stunning black frames. This brilliant apartment features ducted air-conditioning, underfloor insulation, secure basement parking, elevator and stairway access, lockable storage cage, new glazing throughout, and a brilliant outdoor area accessed off the main living area, an additional shared use of the complex's rooftop terrace and having its own additional separate secure access off Molle Street. Outstanding city location, with within walking distance of everything you could wish for: stroll into the revitalized city, walk to Salamanca and Sullivan's Cove, close to UTAS's city and Sandy Bay campuses, the Royal Hobart Hospital, South Hobart village and popular Linear Park walking trail. It is difficult to imagine a more convenient location. 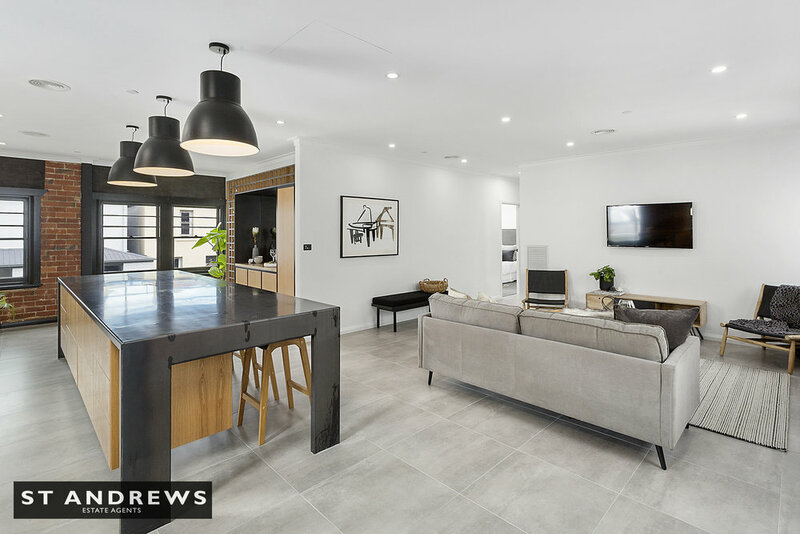 This property is a one-off, a slice of Hobart history, a showcase of industrial chic, premium finishes and incredible convenience.